New Delhi airport was leased to a private operator in 2006 and subsequently went through a major upgrade. Another upgrade is currently in progress, with the first phase expected to be completed by 2021. The construction of Terminal 3, which opened in 2010, vastly changed the airport's functionality by bringing international and domestic flights (except for low-cost carriers) together under one roof. It also doubled the airport's capacity. In 2017, Delhi airport handled 63.5 million passengers, making it the seventh busiest airport in Asia and one of the 20 busiest in the world. It now receives more traffic than airports in Singapore, Seoul, and Bangkok! Passenger traffic is expected to cross the 70 million mark in 2018, resulting in the airport operating beyond its capacity. The new-look airport has won numerous awards following its upgrade. This includes Best Improved Airport in the Asia Pacific Region by the Airports Council International in 2010, Best Airport in the World in the 25-40 million passengers category by the Airports Council International in 2015, Best Airport in Central Asia and Best Airport Staff in Central Asia by Skytrax at the World Airport Awards in 2015, and Best Airport in the World (along with Mumbai airport) in the 40 million+ passengers category by the Airports Council International in 2018. The airport has also won awards for its environmentally-friendly focus. These include the Wings India Award for Most Sustainable and Green Airport, and a silver medal for sustainable waste management initiatives in the Airports Council International's Asia-Pacific Green Airports Recognition 2018. A new hospitality district called Aerocity is also coming up adjacent to the airport and provides convenient access to the terminals. 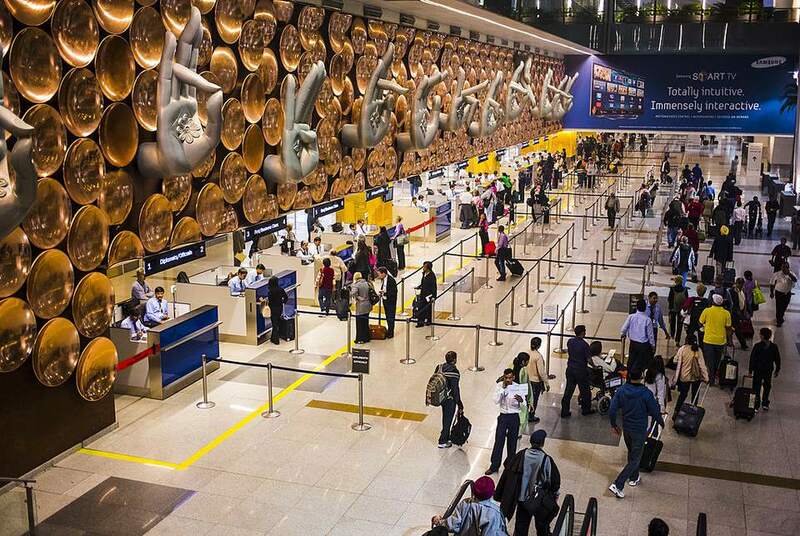 Changes to the master plan have been made to accommodate Delhi airport's rapidly growing traffic. A new air traffic control tower is being added in 2018, and a fourth runway in 2019, to help reduce air congestion and handle more flights. This will increase the airport's flight per hour capacity from 75 to 96. In order to improve the airport's infrastructure, Terminal 1 will be expanded. To facilitate this, the operations of domestic low-cost carriers have been relocated to the previously decommissioned Terminal 2, which is the old international terminal. Go Air shifted in October 2017, and IndiGo and Spice Jet partially shifted on March 25, 2018. Terminal 2 has been refurbished and has 74 check-in counters, 18 self-check-in counters, six baggage claim belts, and 16 boarding gates. Terminal 1D (departures) and Terminal 1C (arrivals) will be merged into one terminal and expanded to accommodate 40 million passengers a year. Once this work is complete, operations from Terminal 2 will be shifted back to Terminal 1, Terminal 2 will be demolished, and a new Terminal 4 built in its place. In addition, a new Delhi Metro train station has been constructed at Terminal 1, on the Magenta Line. This station will start functioning when the Magenta Line becomes fully operational, hopefully by the end of June 2018. The Terminal 1 Metro Station will have moving walkways to terminals 2 and 3, so passengers can use the Magenta Line to access any terminal at Delhi airport. Indira Gandhi International Airport (DEL). It was named after a former Prime Minister of India. Terminal 1C - Some IndiGo and Spice Jet domestic arrivals (see below). Terminal 1D - Some IndiGo and Spice Jet domestic departures (see below). Terminal 2 - All Go Air domestic flights, and some IndiGo and Spice Jet domestic flights. Terminal T3 - International and domestic flights, with the exception of low-cost carriers listed above. This new terminal is close to Terminal 2, which has been recommissioned. The IndiGo flights that have been relocated to Terminal 2 are numbered from 6E 2000 to 6E 2999. Their destinations are Amritsar, Bagdogra, Bengaluru, Bhubaneshwar, Chennai, Raipur, Srinagar, Udaipur, Vadodara, and Vishakhapatnam. The SpiceJet flights that have been relocated to Terminal 2 are SG 8000 to SG 8999. Their destinations are Ahmedabad, Cochin, Goa, Gorakhpur, Patna, Pune, and Surat. It's possible to walk between Terminal 2 and Terminal 3 in about 5 minutes. Transfer between Terminal 1 and Terminal 3 is along National Highway 8. It's necessary to take the free shuttle bus, a cab, or Metro Airport Express train. Allow about 45-60 minutes for the transfer. Free shuttle buses also operate between Terminal 1 and Terminal 2. World-class Terminal 3 has 168 check-in counters, 130 immigration counters, 78 aerobridges, 92 moving walkways, business centers, restaurants, and shopping mall. A total of 55 new immigration counters were recently added, including 10 new counters for passengers with e-visas. In addition, there are plans to introduce e-clearance immigration gates at Delhi airport on a trial basis in the near future. A luggage storage facility ("left luggage" facility) is available to both domestic and international passengers. It's located in the Airport Connect at the Skywalk Level of Terminal 3 (by the overpass between the Metro station and Terminal 3). The maximum period for storage is 30 days. Free wireless Internet is available in all terminals. However, users must get a password sent to their cell phone. A list of found items is updated regularly on the airport's website. New Delhi Airport has a variety of airport lounges. There's one Premium Lounge for first class and business class passengers of selected airlines. It's located on Level 3 of the international departures area in Terminal 3. There's are several Plaza Premium lounges spread across the terminals. For departing international passengers, the main lounge is located on Level 4 of in Terminal 3. Facilities include buffet meals, bar, workstations and wireless Internet, newspapers, magazines, showers, spa, and massage. Access passes for the International Plaza Premium Airport Lounge (Departures) and International Plaza Premium Airport Lounge (Arrivals) can be bought online from TripAdvisor in conjunction with Viator. The ITC WelcomGroup has an environmentally-responsible Green Lounge in Terminal 3. Most people agree it's better than the Plaza Premium lounges. It's possible to access the lounge by paying for a buffet meal (1,200 rupees without alcohol and 1,800 rupees including alcohol). There's also an exclusive American Express Platinum Lounge in the departures area of Terminal 3, near the food court. Terminal 3 has a six-level car park that can hold up to 4,300 vehicles. Expect to pay 80 rupees per car for up to 30 minutes, 180 rupees for 30 minutes to 2 hours, 90 rupees for each subsequent hour, and 1,180 rupees for 24 hours. The rate is the same for car parking at the domestic terminal. A "Park and Fly" facility is also available at Terminal 3 and Terminal 1D. By booking online, passengers who need to leave their car at the airport for an extended period can obtain special discounted parking rates. Passengers can be dropped off and picked up at the terminals free of cost, as long as vehicles remain attended. There are a number of Delhi Airport transfer options, including the Delhi Metro Airport Express Train Service. During winter, from December until February, Delhi airport is often badly affected by fog. The problem is usually the worst in the early mornings and evenings, although at times blankets of fog will remain for days. Anyone traveling during this time should be prepared for flight delays and cancellations. There is a Holiday Inn transit hotel at Terminal 3. Rates start from 6,000 rupees. There are also sleeping pods inside the international departures area of Terminal 3. The other alternative is hotels near the airport, mostly located in the new Aerocity precinct or along National Highway 8 in Mahipalpur.